For some reason I didn't think Madame Tussaud was a real person. I thought she was like Aunt Jemima or Victoria of Victoria's Secret. Makes me wonder who else I thought was fictional was actually real. Anyway... let's get back to the subject: Madame Tussaud. Yes, she was a real person, a wax sculptress living in Paris during the French Revolution. In Madame Tussaud: A Novel of the French Revolution, Michelle Moran presents a fictionalized account of Madame Tussaud, then known as Marie Grosholtz, as she struggles to survive the Revolution with her head still attached. Marie helps her 'Uncle' Curtius run his museum of wax figures in Paris where they do rather well for themselves. Business really picks up when the Royal Family takes a tour. Soon after this visit, Marie is invited to the palace to teach the King's sister, Princesse Elisabeth, the art of creating wax sculptures. Friends of Marie's uncle and members of his salon, Robespierre and Camille Desmoulins, don't think it's a good idea for her to accept. Marie, on the other hand, believes it would be good for business. As the you-know-what hits the fan and the peasants get revolting, Marie finds herself a dangerous spot. She can't be seen as a royal sympathizer yet if she abandons the Princess she could be seen as a traitor by the royal family. Somehow Marie must appease both sides if she wants to outlive the Revolution but as things get even hairier it becomes clear that anyone with any connection to the Royal Family is doomed. 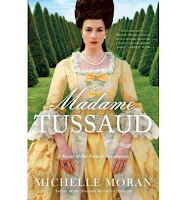 Michelle Moran revealed in the afterword that although Madame Tussaud published her memoirs she was still something of an enigma. She never revealed how she truly felt about the Revolution. Michelle Moran makes her sympathetic to the members of the Royal Family as fellow human beings in pain. If she did feel this way, she must have had quite the poker face. The terrible things she is forced to do, like make death masks of decapitated corpses, would test the strength of anyone. What a force to be reckoned with she must have been. Just as I was impressed with Michelle Moran's ability to create a feeling of time and place in Cleopatra's Daughter, I was even more so with Madame Tussaud. The fear and terror of people trying to survive in a lawless world, where a mob can tear another human to pieces over a piece of cloth, is palpable. These were not fun times. The only thing that bothered me about the story was how, after all those years of jerking Henri around, her marriage came about. Something was a bit off for me there. As this was only a glimpse of Madame Tussaud's life, I suspect there are a lot more stories to tell. This book made me want to find out more. Cool! I never really thought about or did any research into who Madame Tussaud really was. this sounds incredibly interesting! Thanks for enabling, Chris! This sounds great! I still need to read Cleopatra's Daughter. Someone has suggested this for my book club, so I'm glad to see it's good. Lol @ Aunt Jemima & Victoria Secret. Sounds interesting. I want to know more. I never knew anything about her either. This sounds like a good read. Andi- She's turned out be a fascinating person. Lola- That one is so good!! Kathy- I hope you all enjoy it. Lena- I hope you give it a try. Kelly- I'm glad I'm not the only one!